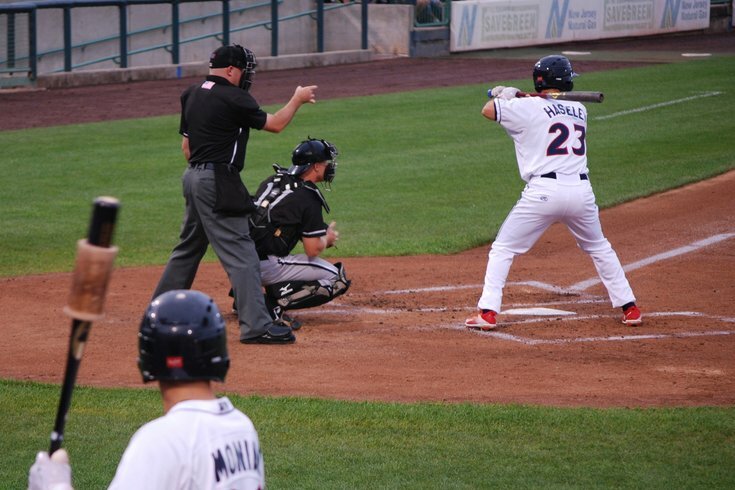 Mickey Moniak watches fellow first-round pick Adam Haseley in his first at-bat with the Lakewood BlueClaws during the 2017 season. We've had over a month of baseball and things are actually looking up in South Philly. For the first time in what feels like ages, the future of the team is actually in Phillies uniforms and not in the minors, grasping and clawing at a jump to the Show. The Phillies are in playoff contention, and though still very early in a marathon season there seem to be serviceable (or even star) pieces at the plate, in the rotation and in the bullpen. That being said, the team is far from an Astros or Dodgers level of competitiveness and keeping track of the action in the farm system is always a good way to see what could be waiting in the wings or threatening to take away a struggling Phillie's job (see J.P. Crawford's .188 batting average). It really seems as though the speedy Quinn has been on the cusp of making the majors for years. Currently sporting a .289 batting average with 12 stolen bases, Quinn had a four-RBI game a few weeks ago and has been solidly swinging the bat in Triple-A so far this season. Nearing baseball middle-ages, Quinn is 25 and is nearing now-or-never territory. If Aaron Altherr continues to struggle, Quinn may just get his chance. Who is Meneses? You are forgiven for having never heard of him. Not really a prospect, the 26-year-old from Mexico has hit a ridiculous .421 over his last 10 games and .340 overall for the season. If this continues the Phillies may have no choice but to give him a serious look. Want a stud starter to drool over? Check out the 22-year-old, twice-traded Dominican who is dominating for the Iron Pigs. He is 4-0 with a 0.84 ERA so far this season and has allowed just three runs all year (in 32.1 innings pitched). Irvin, 24, has won three straight decisions over his last four starts, most recently a seven-inning shutout appearance Saturday. He is a prime candidate for pitching depth should an injury befall the Phillies rotation. The Phillies' 2015 first round pick is just 20 but has ascended all the way to Double-A. After a horrific start at the plate, the outfielder has hit .300 over his last 10 games and lifted his batting average 41 points to .212. At just 19, Sanchez is the franchise's top rated prospect and is fresh off 6.2 innings of scoreless baseball last week. He has a solid 3.58 ERA through four starts — impressive for a teenager. The Phillies first overall pick in 2016 isn't performing nearly how scouts, fans or coaches would like. The 20-year-old is starting his third stint in the minors and has hit a dreary .220 from the plate with zero home runs. Hopefully he finds the learning curve soon. Cozens is a household name for serious Phillies fans, who remember him for mashing 67 home runs and 200 RBI combined in 2016 and 2017. He's got just seven homers this year and has 20 more strikeouts than he has total hits. He's hit just .243 over his last 10 games. Eshelman, like Cozens, is a name known to many for his 13-3 showing last season across Double and Triple-A. But he's been awful this season. In seven games in 2018 he has a 6.87 ERA and 1-3 record. Two starts ago, he allowed 12 hits in 6.1 innings. The Phils' seventh best rated prospect has a fiery fast ball but not much else it seems, as he's been struggling with a 5.75 ERA through six starts this season. Still, his strikeout-to-walk ratio — 34-12 — is impressive.